Physicists build giant machines to study tiny particles. Now, electrons — thankfully immune to bouts of dizziness — traverse the inside of this zeppelin-shaped monstrosity located in Karlsruhe, Germany. Building the experiment took years and tens of millions of dollars. Why create such an extreme apparatus? It’s all part of a bid to measure the mass of itty-bitty subatomic particles known as neutrinos. KATRIN, which is short for Karlsruhe Tritium Neutrino Experiment, started test runs in May. The experiment is part of a multipronged approach to the study of particle physics, one of dozens of detectors built in an assortment of odd-looking shapes and sizes. Their mission: dive deep into the standard model, particle physicists’ theory of the subatomic building blocks of matter — and maybe overthrow it. Developed in the 1960s and ’70s, the standard model has some sizable holes: It can’t explain dark matter — an ethereal substance so far detected only by its gravitational effects — or dark energy, a mysterious oomph that causes the cosmos to expand at an increasing rate. The theory also can’t explain why the universe is made mostly of matter, while antimatter is rare (SN: 9/2/17, p. 15). So physicists are on a quest to revamp particle physics by probing the standard model’s weak points. Major facilities like the Large Hadron Collider — the gargantuan accelerator located at CERN near Geneva — haven’t yet found where the standard model goes wrong (SN: 10/1/16, p. 12). New experiments like KATRIN might be able to ferret out answers. Also joining the ranks are Muon g-2 (pronounced “gee minus two”) at Fermilab in Batavia, Ill., and Belle II in Tsukuba, Japan. A behind-the-scenes look at these experiments reveals the sweat, joy and sacrifice that goes into each of these difficult enterprises. These efforts involve hundreds of researchers, sport price tags in the tens of millions of dollars and require major technological undertakings: intricate electronics, powerful magnets and ultraclean conditions. Researchers have built complex apparatuses with their own hands, lugged tons of equipment across continents and cleaned the insides of detectors until they gleam. Here’s a glimpse at three of the latest standard model challengers. Electrons and their antimatter partners, positrons, take laps around a 3-kilometer long, ring-shaped accelerator and collide at the center of the Belle II detector, producing a class of particles called B mesons. These particles contain a bottom quark, an exotic particle not found in run-of-the-mill matter. Scientists sift through the data produced when B mesons decay inside the 8-meter-tall detector to learn about the particles’ weird ways. 1. An accelerator sends electrons from one end and positrons from the other into Belle II. 2. Tracking detectors follow particles’ paths after collision, pinpointing B mesons. 3. Quartz sensors distinguish between similar types of particles. 4. A calorimeter measures energies of particles. 5. Outer layers spot particles that get past inner sections. Certain B mesons seem to prefer to decay into electrons, rather than their heavier cousins, muons (SN: 5/13/17, p. 16). That goes against the standard model, which says electrons and muons should appear in equal amounts. If this unexpected behavior holds up to scrutiny, something big must be wrong with the theory. B mesons also partake in a process called CP violation, in which antimatter and matter don’t behave like perfect mirror images. Studying CP violation might help scientists understand why the universe is composed of matter and not antimatter. In the Big Bang, matter and antimatter were produced in equal measure and should have annihilated into nothingness, but somehow matter gained an upper hand. It’s “the most fundamental question human beings can ask … ‘Why are we here?’ ” says physics graduate student Robert Seddon. Physicists aim to measure the mass of neutrinos, wily subatomic particles that are nearly impossible to detect. At one end of the 70-meter-long KATRIN, radioactive decays of tritium produce electrons and the antimatter twins of neutrinos. Those antineutrinos escape while the electrons cruise through KATRIN’s blimp-shaped tank and are detected at the other end (SN Online: 10/18/16). The tank, a spectrometer, divvies up the particles according to their energies. Some energy from each tritium decay goes to generating the antineutrino’s mass. That limits how much energy the electron gets. So measuring the electrons’ energies can reveal the mass of neutrinos. KATRIN should officially start taking data next spring. 1. Tritium decays, releasing electrons and antineutrinos, which escape. 2. Electrons travel along beamline to spectrometer. 4. A magnetic field (dotted lines) shepherds high-energy electrons to a detector at the other end. 5. An electric field turns low-energy electrons back. 6. Magnets focus electrons onto the detector. A neutrino’s mass is a tiny fraction of an electron’s. “Why is it so light?” Parno asks. “That’s mysterious.” The standard model initially predicted that neutrinos have no mass at all. But measurements indicate that the particles must have mass, though how much is still a question. Neutrinos barely interact with matter and are incredibly numerous: Billions of neutrinos sail through your thumbnail each second. These particles are so quirky that scientists want to know more. Muons, heavier relatives of electrons, behave like tiny magnets with a north and south pole. Muon g-2, which started up in February, studies the properties of those minimagnets. Researchers beam thousands of muons into a doughnut-shaped electromagnet about as wide as the width of a basketball court. As muons circulate inside the electromagnet, their poles pivot like wobbling tops. Muons are unstable, so as they circulate, they decay into lighter particles known as positrons. The angles at which those positrons fly off can reveal the rate of the muons’ magnetic gyrations and, therefore, the strength of the muons’ magnets. The researchers will compare the measurement to predictions based on the standard model. 1. Muons enter the magnet. 2. Muons circle in the same direction repeatedly. 3. Muons decay into positrons, which are picked up by detectors that measure energy and particle tracks. Transient particles blip in and out of existence everywhere in space. Those particles tweak the rate at which the muons gyrate. If undetected particles are out there, Muon g-2’s measurement might not square with predictions. A similar experiment performed at Brookhaven National Laboratory in Upton, N.Y., in the 1990s hinted at a mismatch (SN: 2/17/01, p. 102). Muon g-2 will make a more precise measurement to follow up on that lead. Muon g-2’s magnetic field is about 30,000 times as strong as Earth’s magnetic field. Such strength is useful only if the magnetic field is ultrauniform. So physicists strategically placed thousands of tiny metal shims — many just a fraction of the thickness of notebook paper — to adjust the magnetic field. Hours of “shimming” left physicists’ hands “covered in dirt and oil and grease,” says physics graduate student Rachel Osofsky of the University of Washington in Seattle. The dirty job was worth it: The magnetic field is now uniform to within 0.0015 percent. To anyone but a physicist, it sounds like something out of “Star Trek.” But lepton universality is a real thing. It has to do with the Standard Model of particle physics, which describes and predicts the behavior of all known particles and forces, except gravity. Among them are charged leptons: electrons, muons and taus. A fundamental assumption of the Standard Model is that the interactions of these elementary particles are the same despite their different masses and lifetimes. That’s lepton universality. Precision tests comparing processes involving electrons and muons have not revealed any definite violation of this assumption, but recent studies of the higher-mass tau lepton have produced observations that challenge the theory. A new review of results from three experiments points to the strong possibility that lepton universality—and perhaps ultimately the Standard Model itself—may have to be revised. The findings by a team of international physicists, including UC Santa Barbara postdoctoral scholar Manuel Franco Sevilla, appear in the journal Nature. “As part of my doctoral thesis at Stanford, which was based on earlier work carried out at UCSB by professors Jeff Richman and Michael Mazur, we saw the first significant observation of something beyond the Standard Model at the BaBaR experiment conducted at the SLAC National Accelerator Laboratory,” Franco Sevilla said. This was significant but not definitive, he added, noting that similar results were seen in more recent experiments conducted in Japan (Belle) and in Switzerland (LHCb). According to Franco Sevilla, the three experiments, taken together, demonstrate a stronger result that challenges lepton universality at the level of four standard deviations, which indicates a 99.95 percent certainty. BaBaR, which stands for B-Bbar (anti-B) detector, and Belle were carried out in B factories. These particle colliders are designed to produce and detect B mesons—unstable particles that result when powerful particle beams collide—so their properties and behavior can be measured with high precision in a clean environment. The LHCb (Large Hadron Collider b) provided a higher-energy environment that more readily produced B mesons and hundreds of other particles, making identification more difficult. Nonetheless, the three experiments, which measured the relative ratios of B meson decays, posted remarkably similar results. The rates for some decays involving the heavy lepton tau, relative to those involving the light leptons—electrons or muons—were higher than the Standard Model predictions. While intriguing, the results are not considered sufficient to establish a violation of lepton universality. To overturn this long-held physics precept would require a significance of at least five standard deviations. However, Franco Sevilla noted, the fact that all three experiments observed a higher-than-expected tau decay rate while operating in different environments is noteworthy. Data from BABAR, Belle and LHCb experiments hint at phenomena beyond the Standard Model of particle physics. The Standard Model of particle physics describes the properties and interactions of the constituents of matter. The development of this theory began in the early 1960s, and in 2012 the last piece of the puzzle was solved by the discovery of the Higgs boson at the Large Hadron Collider (LHC) at CERN in Switzerland. 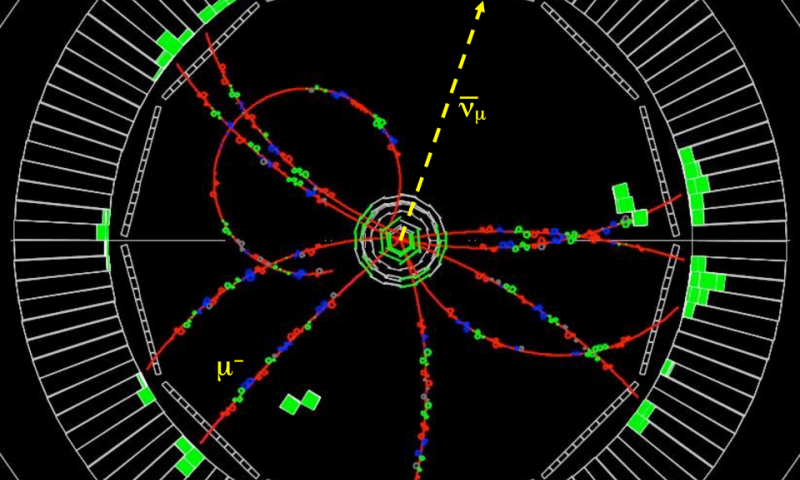 Experiments have confirmed time and again the Standard Model’s very accurate predictions. In this Q&A, particle physicist Vera Lüth discusses scientific results that potentially hint at physics beyond the Standard Model. The professor emerita of experimental particle physics at the Department of Energy’s SLAC National Accelerator Laboratory is co-author of a review article published today in Nature that summarizes the findings of three experiments: BABAR at SLAC, Belle in Japan and LHCb at CERN. Over many years, different experiments have tested this assumption – referred to as “lepton universality” – and to date no definite violation of this rule has been observed. We now have indications that the rates for B meson decays involving tau leptons are larger than expected compared to the measured rates of decays involving electrons or muons, taking into account the differences in mass. This observation would violate lepton universality, a fundamental assumption of the Standard Model. Belle and BABAR were two experiments specifically designed to study B mesons with unprecedented precision – particles that are five times heavier than the proton and contain a bottom or b quark. These studies were performed at e+e- storage rings that are commonly referred to as B factories and operate at colliding-beam energies just high enough to produce a pair of B mesons, and no other particle. BABAR operated at SLAC’s PEP-II from 1999 to 2008, Belle at KEKB in Japan from 1999 to 2010. The great advantage of these experiments is that the B mesons are produced pairwise, each decaying into lighter particles – on average five charged particles and a similar number of photons. To study lepton universality, all three experiments focus on B decays involving a charged lepton and an associated neutrino. A neutrino doesn’t leave a trace in the detector, but its presence is detected as missing energy and momentum in an individual B decay. Once data became available, I rejoined SLAC’s Research Group C and took over its leadership from Jonathan Dorfan. As convener of the physics working group on B decays involving leptons, I coordinated various analyses by scientists from different external groups, among them SLAC postdocs and graduate students, and helped to develop the analysis tools needed for precision measurements. Lepton universality is one of the Standard Model’s fundamental assumptions. If it were violated, unexpected new physics processes must exist. This would be a major breakthrough – even more surprising than the discovery of the Higgs boson, which was predicted to exist many decades ago. Recently, LHCb scientists have reported an interesting result indicating that certain B meson decays more often include an electron pair than a muon pair. However, the significance of this new finding is only about 2.6 standard deviations, so it’s too early to draw any conclusions. BABAR and Belle have not confirmed this observation. The field of ‘High Energy Physics’ or ‘Particle Physics’ is about exploring the fundamental building blocks of matter and interactions between them at the deepest level. The experimental frontier of this field relies on the cutting edge instrumentations and the most advanced computational tools. So, as an experimental high energy physicist, I am excited by the theoretical aspect as well as its experimental advancement is also overwhelming. I started my journey in this field seven years back with the Belle (‘french:beautiful’) experiment as a doctoral student at Tata Institute of Fundamental Research, Mumbai. The Belle detector was located at the interaction region (beam collision point) of the KEKB asymmetric energy electron-positron collider in Tsukuba, Japan. And, the KEKB accelerator holds the current world-record for the luminosity achieved by a high-energy accelerator. The Belle experiment had a successful operational period with several important physics results, and the ‘Observation of CP Violation in B meson system’ led to the Nobel Prize in Physics 2008 to Profs. Kobayashi and Maskawa. The Belle detector recorded about 1 ab-1 data between 1999 – 2010, which continues to produce very competitive physics results. But, to explore the unknown territory of New Physics (beyond the Standard Model of Particle Physics) even more data is needed. For this, the KEKB accelerator is now being upgraded to SuperKEKB and it is designed to produce 40 times larger instantaneous luminosity than its predecessor and with the aim of recording an unprecedented data sample of 50 ab–1. And, to cope with this high collision rate environment, the detector is also being upgraded to Belle II. Although I got a very brief opportunity to work on the detector development for Belle II during my doctoral period, as my thesis was mainly focused on the physics data analysis for the Belle experiment. However, my desire to work on the instrumentation got fulfilled as a post-doctoral fellow in University of Cincinnati. I participated in the construction of time of propagation (TOP) detector, which plays a crucial role in identification of charged particles produced after the collision. The Belle II detector consists of several sub-detectors and TOP detector is one of them. Each sub-detector of the Belle II collects specific information about the collision event. Closest to the beam pipe is the Vertex Detector which consists of two-layers silicon pixel detector and then four-layers of double-sided silicon-strip detector and identifies the vertices (or decay points) of short lived particles (with lifetimes of around a trillionth of a second). Then, the Central Drift Chamber provides the momentum of charged particles by reconstructing their curved trajectories while moving in a magnetic field. Additionally, it contributes to particle identification by measuring the energy loss of charged particles as they pass through the gas that fills the volume. Aerogel Ring Imaging Cherenkov detector in the forward endcap region and TOP in central region of the detector provides charged particle identification based on angle of the cherenkov photon emitted by the charged particle passing through the detector medium. The The electromagnetic calorimeter reuses Belle’s thallium-doped cesium-iodide crystals with upgraded read-out electronics. And, the flux return of the Belle-II solenoid magnet, which surrounds the electromagnetic calorimeter, is instrumented to detect KL mesons and muons. In February 2016, electron and positron beams were successfully stored in the upgraded SuperKEKB accelerator for the first time. Now, most of the detectors are installed in the Belle II detector. And, on April 11th this year, the Belle II detector was rolled-in from its construction area to the interaction region of the SuperKEKB particle accelerator. The roll-in of the assembled Belle II detector, weighing 1,400 tons, has to be carried out very gently and with great care. And, this successful event was broadcasted live worldwide. Belle II is now getting ready in full swing to record the first collisions at the SuperKEKB scheduled at the end of this year. The Belle II collaboration has more than 600 members from 23 countries and this also provides a nice ground for cultural exchanges while interacting with colleagues from around the world. I really admire working in these large collaborations, as people go beyond the boundaries of geography, race and religion and come forward for a common goal ‘to extend the knowledge of mankind’. The sense of joy and thrill, while exploring together the recipe of our Universe as we see today, is unparalleled.